Chant du Départ: At Last! 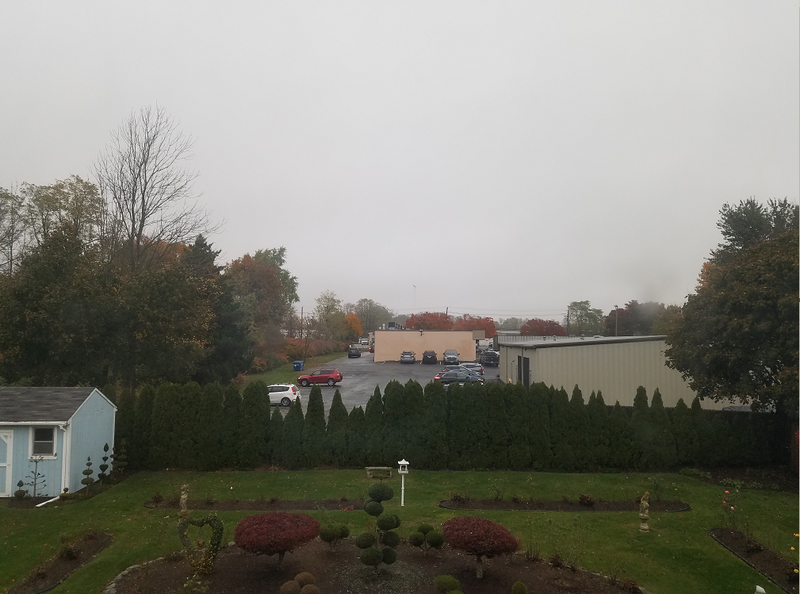 Friday was a gray, rainy day in Little Rhody, but as I headed into work, I noticed the trees. They were finally changing their colors, not here and there, but a lot of them. 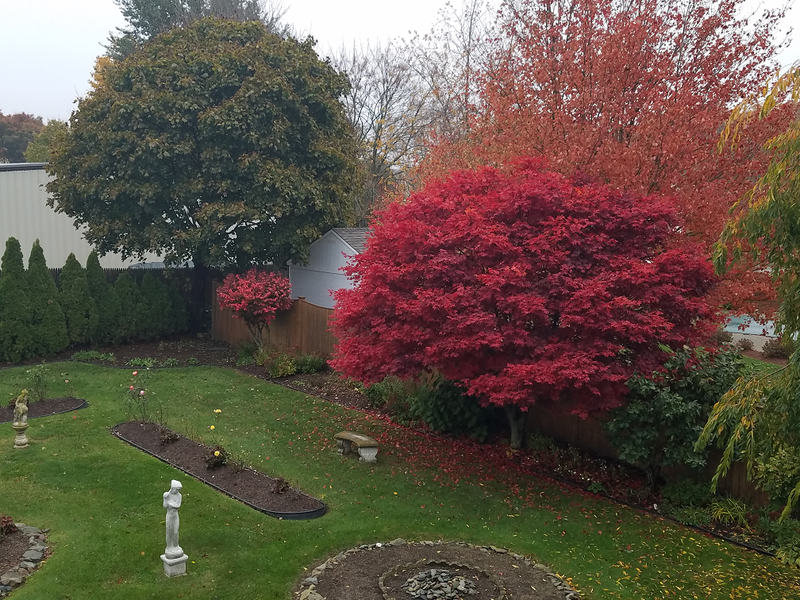 In my own, and my neighbor's, backyard was a lot of color. But with the wind and the rain, it won't last long. 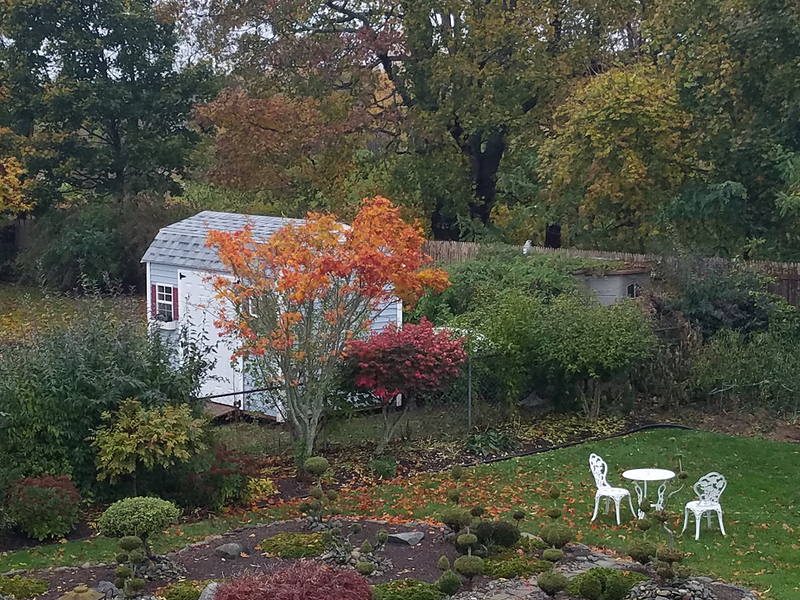 That golden tree, just in front of the neighbor's shed, has been there a long time. It hasn't grown as well as the other Japanese maple we got at the same time, which I'll show you in a minute. This is the very first year that the little guy has offered such a bright show of red and gold. Too bad so many of its leaves have fallen already. But this show was worth the wait. Here's the other Japanese maple on the other side of the yard. This one (which The Missus Herself brought home with the other, both were no more than sticks) has turned this brilliant red every fall. Earlier this week I thought that he wouldn't be putting on much of a show this year. I need to be more patient, everything happens according to the Lord's schedule, not mine. 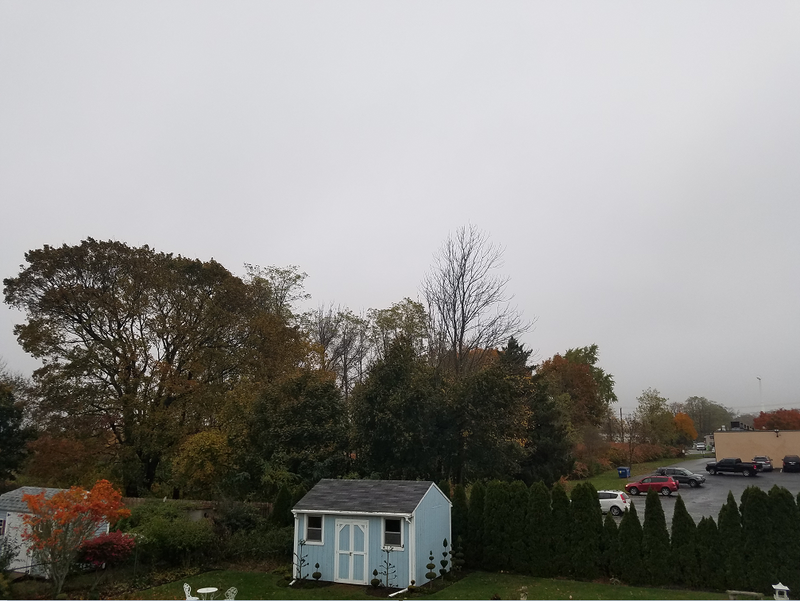 A gray day, a wet day. Some trees have shed their leaves, some are still green, some are transitioning to their Autumn splendor. It may not last long this year, but even after all of this time, it still takes my breath away. Though their color is muted by the mist and intermittent rain, the trees display their glory. Not as bright maybe, but every bit as beautiful. I don't know if the sun will be out again before the leaves all fall, but if not, the display I saw today makes me a lucky man. Maybe, if the sun does shine this weekend, I'll get out and try to capture some more of this glorious color. I hope it does but, again, not my will, His. Nice photos, you have a very beautiful back yard ( or garden, as the British say ). We tend to refer to it as a garden. The Missus Herself gets all the credit. I just lift heavy things. Lot of work and love in that back yard Sarge, it shows too. Those Japanese maples really show the red eh? How is the new bridge fitting in? I like the new bridge, grandkids like it too. So it's a success. It fits nicely. I have a Snowball bush ( Viburnum ) that turned dark red this year. But all the leaves have come off now. I love it too, even the rainy days. Like today. As has our backyard. The lower elevations of the Blue Ridge are at peak now. A day trip to Mabry Mill (milepost 176) maybe in order. It has to be gorgeous down there. A trip I need to make someday. Fall days are the best!! If we are lucky we get about three of them. You're not far off Joe! We’re seeing color here, too, just not as vibrant. It may be because there isn’t so much green present. The green helps show the contrast. Especially on a hill with mixed fir trees and maples. Then it's awesome. 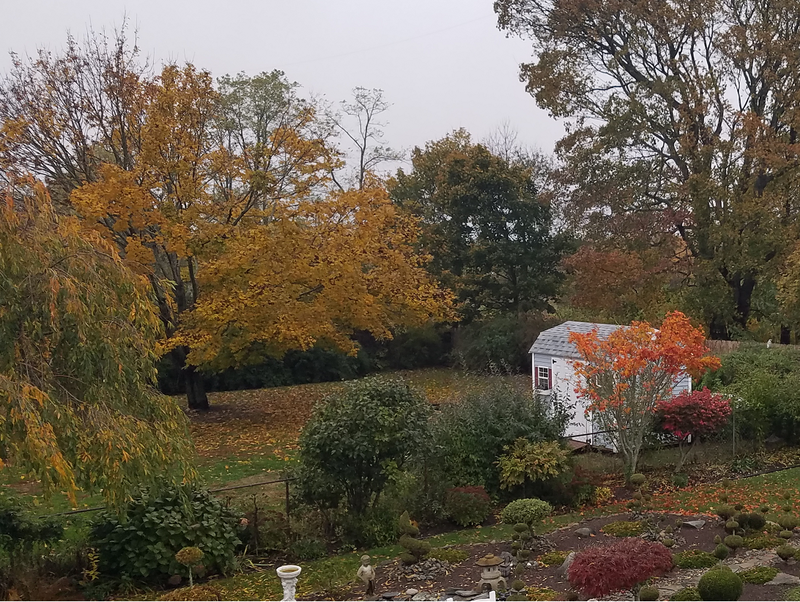 A very beautiful yard, must be a real joy to watch the changing of the seasons from your back porch or your loft window. Your wife does good work. And her yard drudge ain't half bad either. The four seasons in my backyard are a delight to me. Soon enough (within the next couple of weeks), the pond gets "winterized." Pump comes out, air bubbler goes in, we put a large container in the deep end for the fish who like that kind of thing. Some do, some don't. Then we wait for the first snows. Very pretty! We had our fall color show a couple of weeks ago. Then the winds came, and blew most of the leaves off the tree. I had to go get some coffee yesterday, and I could see the little coffee shop as I approached it because all the leaves have dropped. I usually almost miss the turn becuase the trees hide the little place, but not in the Fall! Yes, much rain last night, big wind during the day. One of the bigger maples down the street was a gorgeous red yesterday. Today, hardly a leaf left. It comes and it goes, too fast sometimes! You've probably shown it in past photos, but I never noticed the business behind your place. I hope whatever they do there doesn't disturb your peace. Not at all. It's a gymnastics studio where young kids learn and become strong. The fellow who runs it is good people. They are excellent neighbors. On the other side of the parking lot are small businesses. No bother at all. I remember stopping for coffee a lot at a place on the way to work where the little balerinas went to learn style and poise. I was quite looking forward to dropping off my daughter there. It was not to be. The leaves finally turned here in metroparkcentralis 3 days ago. From green to gone wild autumn was just 3 days. We went for a drive out to the east counties just to enjoy it today. A lot of leaves were gone with the wind Friday night into Saturday morning. Ephemeral.